My father Bernard Rogers was one of 16 children. JAMES TURNER STREET 21/06/2015. Christmas Eve True Story My dad Jack Stanton worked 12 hour nights for Henry Wiggins and at the week end worked as a part-time lorry driver for Biggs' the greengrocer while my mom 'Berta' was a cook at Foundry road school. We lived in James Turner Street in the same house my father had lived since being born in 1914. The area was a bit run down and tired, but the people were proud and hard working, they earned enough to get by but some were poor, some very poor. One Christmas about 1958, I was very young, 6 or 7 years old but I remember it well, my dad had been out delivering for Biggs', and at several places he'd visited they had given him a turkey as a gift, in those days when the shops shut for the holidays they were shut for a long time so wouldn't be able to keep left over poultry and fresh vegetables. When he had finished he brought home 5 huge turkeys a couple of sacks of unsold potatoes and loads of carrots and sprouts, we didn't have a fridge to keep the poultry in, hardly anybody did in those days, so they hatched a plan to cook them and let everyone have a share. My mom with the help of Elsie Hunt, the head cook at the school, asked the caretaker Mr Bruton if he would unlock the school gates and let us into the school kitchens to cook the turkeys, he agreed, and so it began. I was told of your Winson Green to Brooklands site and was intrigued to take a look. 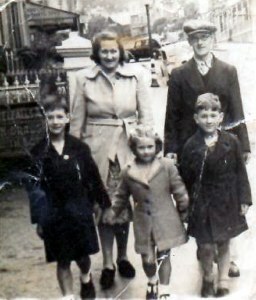 I am one of 5 children - 3 of which were born at 161 James Turner Street in 1948, 1952 and 1955. We were the Folks family Gladys and Ted with eldest daughter June, son David and then Barbara, (myself) Carol and Jacqueline. We went to Foundry Road School. We were always in Currys corner shop and their son was one of the children we played street games with - Hopscotch, Hide and Seek, Thunder and Lightening. We attended Sunday school at Bishop Latimer Church, my eldest sister was a Sunday school teacher for a while. We moved out of James Turner Street in 1960 and moved to Ninevah Road where my mom ran the corner shop - corner of Ninevah and Holliday Road. 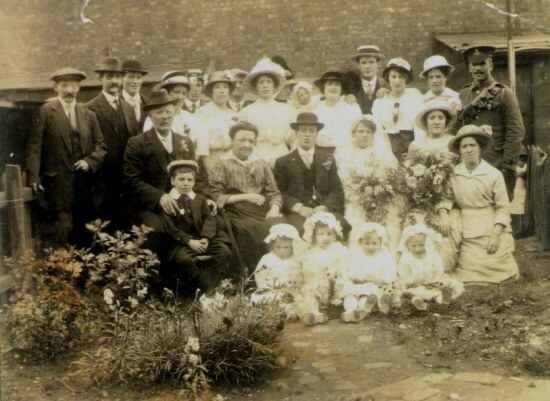 My eldest sister June, myself and my younger sister Jacqueline were all married at Bishop Latimer Church. When we moved from the corner shop in Ninevah Road we moved back to my mom's family home in Willes Road, where my mom continued to live until she died in 2002. We all found watching the recent TV programme 'Benefit Street' devasting as the memories we have of living there were of a happy childhood and a very different culture. Ted just to say how horrified I was to see James Turner Street , in its present state as depicted in channel 4s programme last night 06/01/2014. I was brought up in that street and considering how it was 45 yrs ago, a genuine community. It just dismayed me to see what sort of vermin have colonised the area and I am ashamed to tell any one I spent my childhood there. My grandmother Agnes Keziah Rowe lived at 101 James Turner Road which I found on the electoral roll register in 1930 also my aunt Kathleen M Rowe was born in 1934 possibly in the same house. 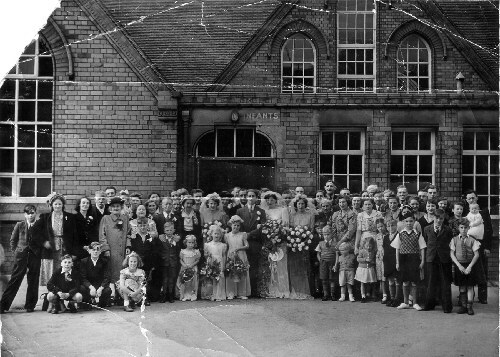 Agnes later met my grandfather Harry Dawson and married in 1939 and moved to Peel St.The time between 1930 & 1939 is a mystery as well as my aunts fathers name any info or anyone around this area would be amazing. In addition to this I have some photo's from around 1945-1950 of my family when living at Peel St , I will try to forward them to you. My name is Des Rogers born in James Turner St 1946 and went to Foundry Road and HNR. I have just found the site and have spent hours looking at it and are only part way into it. 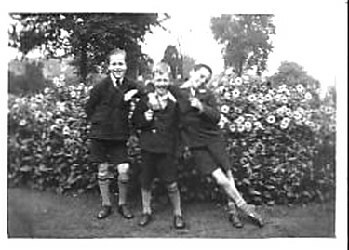 ALEX FOUND THE PHOTO MENTIONED ABOVE AND SENT THE SITE A COPY, MANY THANKS ALEX. I now live in France, and don't get back much to see if things have changed. The Wooton family. 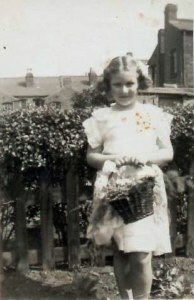 Nita age 6. Two photo's, one of my family and me, and one of myself aged 6 all dressed up for the church procession, in a dress my mom made from parachute "silk". Didn't I think it was great !! The boy's brigade band who featured in the parade also used to practice down the street sometimes on a Sunday. I remember an old man living up the road who used to dry banana skins over his black lead fire-grate to use instead of tobacco. Does anyone remember the 'big snow' of 47/48 ? I have just heard from Jean Adams who used to live opposite, it was wonderful to hear from her, and she remembered me and my two brothers. Anne (Maddox) Bamford; Billy Bamford. Ada Bamford (Bridegroom); Violet (Bamford) Radford; Auntie Nelly Harrison.